Are you looking for the best all-around website builder? One that’s easy to use and doesn’t compromise on quality? If so, Weebly might just be the builder for you. Most Weebly reviews are favorable and praise the platform for its affordability, ease of use, and robust feature set. Weebly is great tool for individuals and small-business owners who’ve either never designed a website before, or who are just looking for an easier builder to use moving forward. It’s a great option for advanced users, too, as the platform provides a wealth of cutting-edge features that take advantage of the most modern aspects of the Internet. This makes Weebly an ideal builder for amateurs and experts alike. One of the first decisions I needed to make after opening an account with Weebly, was choosing what kind of template, also called a theme, I wanted my site to have. The theme establishes a consistent look and feel across all pages of your site, and serves as a starting point upon which to add your content. Weebly themes are free and come in hundreds of different styles categorized into sections such as Bold, Corporate, Fun, Sleek, Minimalist, and so on. New themes arrive all of the time, and are sortable by popularity or by how recently the Weebly team released them. See a theme that strikes your fancy? Click “Preview” to view one of Weebly’s examples of the template in action. Many of the free Weebly templates also let you choose a color scheme that matches your header image or site logo. And if you ever second-guess your choice, it’s easy to switch themes at any time. The Weebly editor is arguably the easiest-to-use tool of its kind. Before I knew it, I was creating professional-looking pages for my website. It only took a few moments for me to get the hang of the awesome Weebly drag-and-drop builder, which is what makes this platform really shine. After I decided upon a theme for my site, the Web page editor appeared with a selection of Web elements in a dock along the left side of the screen. The elements in the dock fall into one of five sections: Basic, Structure, Media, Commerce, and More. Under each section heading are individual elements associated with those categories, including items such as images, audio clips, videos, surveys, and slideshows. 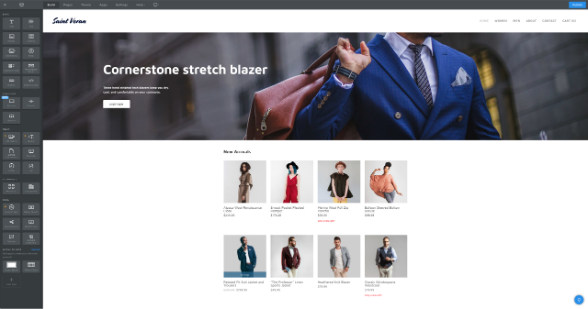 Users can simply drag the elements they want on their site from the left side to the right side of the screen, and arrange the items in any way they’d like. The builder automatically resizes and adapts existing elements on your site to make room for whatever you just added. The Weebly builder is so straightforward, that it’s almost impossible to mess anything up. And depending on how well you know what you want, you can create your Web pages in under 10 minutes apiece. The Weebly software doesn’t require any coding knowledge or experience, and it gives you tons of great options in ways that are easy to understand. Even those with no previous graphic design skills can create gorgeous websites in under an hour. Don’t believe me? To try a Weebly demo yourself, head over to the site and sign up for a free account. All you need is an email address, and you’ll be on your way. Real-time dashboard offers a detailed look at your site’s stats, including everything you need to know about traffic and Ecommerce activity. 5-star mobile app provides almost the same experience as you would get in the desktop version and gives you the power to edit your site on the go, or even create a brand new site from scratch. The App Center is an ecosystem that allows for integration with many third-party services, which is perfect for business owners. Features to maintain your online store including shipping tools, inventory, product search, customer reviews and integrated checkout. Sell anytime, anywhere with in-store pickup, shipping management in the Weebly App, and Facebook Messenger integration. All of these pricing plans are great values for users, but the Pro plan will likely be the best fit for most users. And as the Weebly Pro cost is relatively low compared to the competition, you’re almost guaranteed to get your money’s worth. 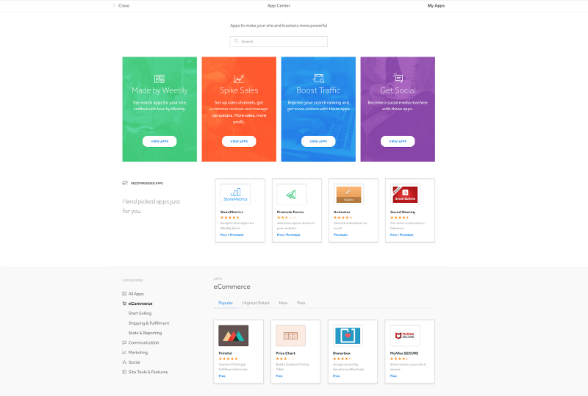 The Weebly price for the Starter package is less than $5 per month and, aside from removing the builder’s branded ads, it also gives users the ability to link their site to a custom domain name. The services at this tier additionally include expanded stats, premium support, customized footers, and the ability to sell up to 10 Ecommerce products. The Pro package, with a Weebly cost of under $10 per month, includes everything from the Starter package, plus the option to add header slideshows, and high-definition audio and video clips. Additionally, the Pro level offers password-protected pages, the option to register up to 100 users for your site, and the freedom to sell up to 25 products. The Business plan is perfect for small business owner operations. It lets users manage inventory, sell digital goods, and access other bells and whistles like coupon codes and a shipping-and-tax calculator. This plan also lets users sell unlimited products and register an unlimited number of members. These days, a big buzzword in the website-builder industry is “responsive design,” which refers to websites that automatically adjust themselves to look great on whatever size screen your visitors are using. And even though its websites have always been optimized for smaller screens, the platform took things to a new level in 2014 when they unveiled Weebly responsive themes. I found Weebly online stores to be amazingly easy to create and use. The builder offers its users a full slate of Ecommerce options that will suit the needs of nearly all small businesses. The Ecommerce tools are in the dock on the left side of the screen, making it easy to add products anywhere you’d like. All paid plans include the ability to set up Weebly stores with shopping carts. The difference is that premium plans let you sell more products while also giving you additional tools to streamline your selling. 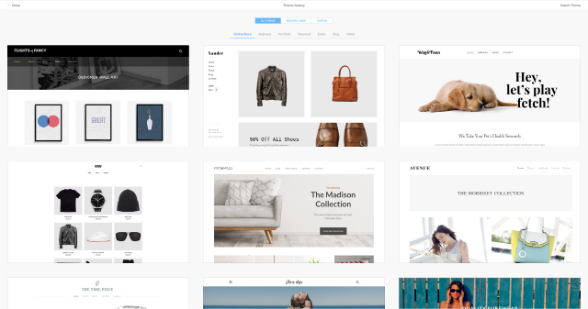 If you’re ready to learn more about Weebly Ecommerce, review the articles in our library to find out the finer points about the features offered. Having a website that you love is great, but what good is it doing the world if no one can find it? Weebly helps users of its platform get found online by giving them the tools and tactics they need to increase their visibility. Weebly search engine optimization (SEO) is easy, thanks to information found in several the builder’s articles, built-in tools and Marketplace apps. There articles tell you all about the best practices of boosting your ranking in search engines. If you’re serious about raising your rank in search engines, take time to read some of Weebly’s blog SEO articles on the topic. And after you’ve finished reading those, head over to the SEO section of the settings menu. On this page is where you can tweak the content that search engines are looking for, along with additional helpful tips on making the most out of SEO on Weebly. While SEO is very powerful there are other ways to drive traffic to your site. That’s why Weebly has built a seamless integration with Facebook ads, that helps you create all kinds of ads from brand awareness campaigns to retargeting visitors to promoting your best seller products. All this works incredibly easy with the same user interface that makes Weebly websites so easy to use. And you don’t even need to add new images as Weebly will let you grab images that you previously uploaded to your online store or website. It all works like charm! Their email marketing tool is also drag and drop, which makes it incredibly easy to build great looking email campaigns. But what’s even more impressive is the suit of email automations that sync seamlessly with your website and online stores so you don’t have to add images or copy all over again. Automations include useful emails like Welcome emails, holiday-themed campaigns, auto-replies for contact forms, happy birthday wishes, newsletter subscription confirmation. And for online sellers there’s other more powerful emails templates and automations like top products, new products updates, feedback and reviews collection, win-back campaigns for lapsed customers, upsell campaigns and loyalty campaigns. If you worry about spamming your customers, Weebly has made it easy for you to segment your lists making sure that the right information goes the right people and they always receive useful content from you. Finally, Weebly’s marketing suite also includes a series of lead capture forms, so once a potential customer has visited your site, you can capture their information and keep them in the loop about your products and services. Among the more popular are popup forms, smart bars, welcome mat and anchored forms. Weebly has built tools that help website owners every step of the way, from getting started with their website, to generating traffic to growing their audience and scaling their business. There are many Weebly pros and cons to weigh when comparing this website builder against its alternatives. While it isn’t perfect in every regard, by and large it’s one of the best builders out there. Want to learn more about this builder’s best and worst features? Read our customer reviews to find out what others think. And if you still have concerns, visit the Weebly forums for answers to every question you can think of. If you ever need help with your website, you can contact the friendly Weebly support representatives via telephone, email, or chat. Weebly help is based in North America and is available every day of the week, with office hours from 6am to 6pm (PT) Monday through Friday, and from 7am to 4pm on weekends. To reach them via phone, call 1-844-493-3259. If you’d rather type with a support representative via Weebly chat, you can click the chat button along the bottom of the website builder. That was a great option for me. Other support alternatives include submitting a help ticket via a form on the site, or you can try to resolve any problems on your own by perusing through the tutorials and support forums. One thing that distinguishes this platform from many other builders, is that Web hosting on Weebly doesn’t cost a thing. Weebly Web hosting is free for all plans and there are no separate hosting cost to worry about. If, however, you do want to link your domain to your site, that does cost extra, but it’s included as part of any of the paid plans. One question you might be asking yourself at this point, is does Weebly offer email services? While many website builders do offer email, with Weebly, email addresses aren’t actually part of the plan. The good news, however, is that this builder has a partnership with Google, making it possible to link your domain name to email addresses. While Weebly email subscriptions aren’t actually provided as part of any premium plans, you can still create email addresses that work with your domain name. Unfortunately, these Google-powered email address aren’t free, but they are relatively affordable and as reliable as any other email-service provider on the Internet. Weebly Inc. gets a lot of love from folks who use their tools, and after I spent some time playing around on the platform, it was easy for me to see why. I’ve tested out a lot of sites like Weebly in the past, but none of them are quite as easy to use. Some of the best offerings are blogs and personal sites, but is this platform good for small businesses, too? Judging by the thousands of retail stores, restaurants, and Ecommerce shops who trust it for businesses, I’d certainly say so. But don’t just take my word for it; read more Weebly feedback in our user review section, and see what other website owners really think about this service. If you’re wondering is Weebly really free? You bet it is. The company doesn’t ask you for any payment information unless you elect to upgrade your account or if you brush up against the limitations of the Weebly free website plan. This makes it one of the few builders that you can use indefinitely without ever paying the company a penny. However there are limitations to the free plan: you can create an unlimited number of Web pages, but all of them will have Weebly branding on them somewhere. If you want to get rid of that branding and take advantage of this builder’s best features, you should consider upgrading to a premium plan. With Weebly, editing my website wasn’t just easy—it was fun! Check out some of the other Weebly reviews on our site, and you’ll see that many users feel the same way. You might see a few complaints, but those are rather rare. We have a ton of articles and comparisons involving Weebly, so browse around to learn more about exactly how Weebly stacks up against the competition. And if you ever want to learn even more about Weebly, contact their helpful support representatives. Weebly is by far one of the best builders I’ve ever used, and I have no problem recommending it to individuals, organizations, or small businesses looking for a great tool to build and maintain a free or premium website.